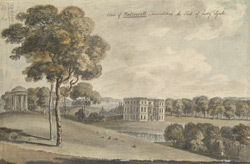 View of Halswell House, in the parish of Goathurst, which was built in 1689 near Enmore. This three-storey block mansion was built in a style similar to the architecture of Christopher Wren. The grounds were landscaped to complement the house, and several ornamental structures were added, including this classical rotunda close to the house.